The intention of this class is to set a Sacred Space where you can experience self-healing work. We'll create a ceremonial offering to assist you with multi-directional grounding in your body, prepare for Theta brainwave state, then relax into journeywork through the sound bath in order to cultivate a deeper resonance within yourself. 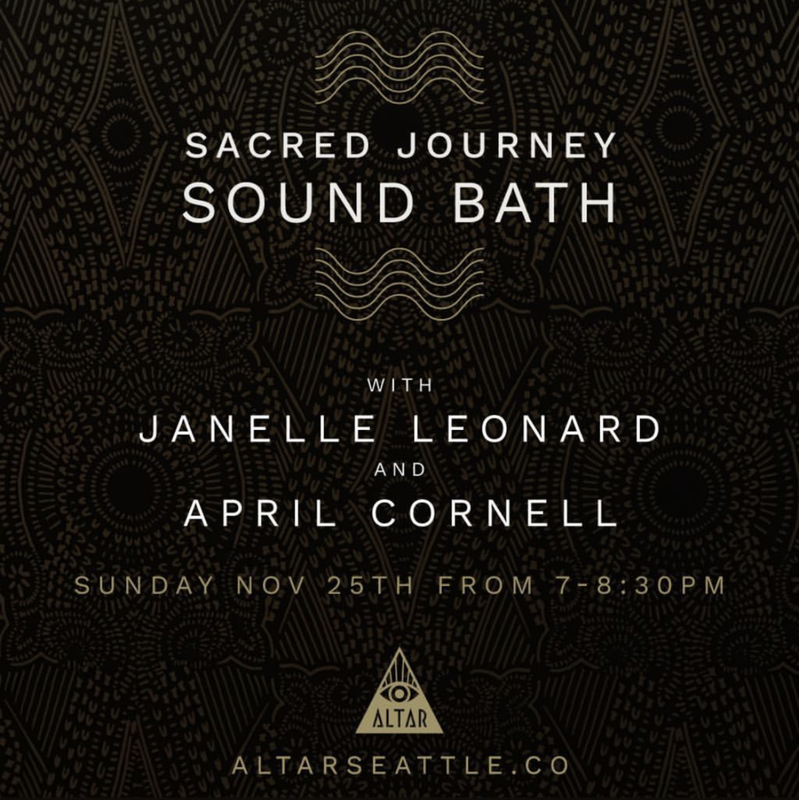 A Sound Bath is a ceremonial concert designed to provide an environment where energy that is no longer needed can be released, shifting the mind, body and spirit into a deeply relaxed state of being. Participants are bathed in powerful vibrations and binaural beats that help entrain their brain waves into Theta. In this deeply relaxed state dynamic healing can take place, activating the parasympathetic nervous system, cellular regeneration, stress release, and emotional/mental/physical healing. Participants lay in a comfortable position on the floor (savasana), while April provides gentle grounding for each participant, helping to fine-tune the energies during the journey. 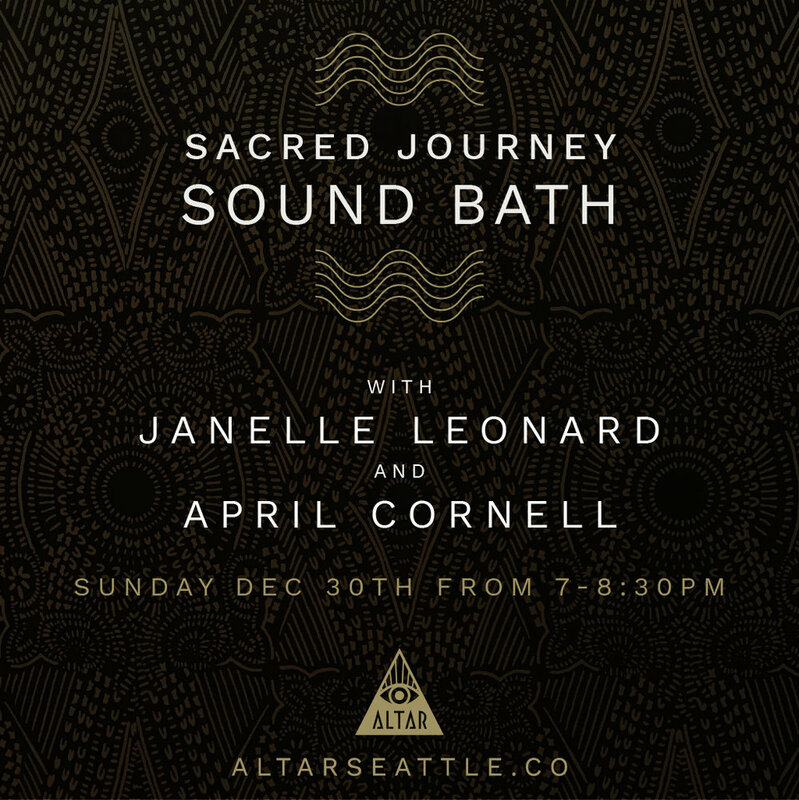 Janelle plays the crystal and Tibetan bowls and Paiste gongs, accompanied by shamanic vocal toning. Many people have reported noticeable physical changes and often experience deep sleep afterward. Please bring anything that you may need to feel comfortable on the floor in silence for 90 minutes. Blankets, pillows, bolsters, yoga mats, etc. are welcome. Wear comfortable clothing and please be hydrated. This event will be held in an exclusive and intimate environment. Space is available to up to 12 people. Doors open at 6:40pm, event beings at 7. 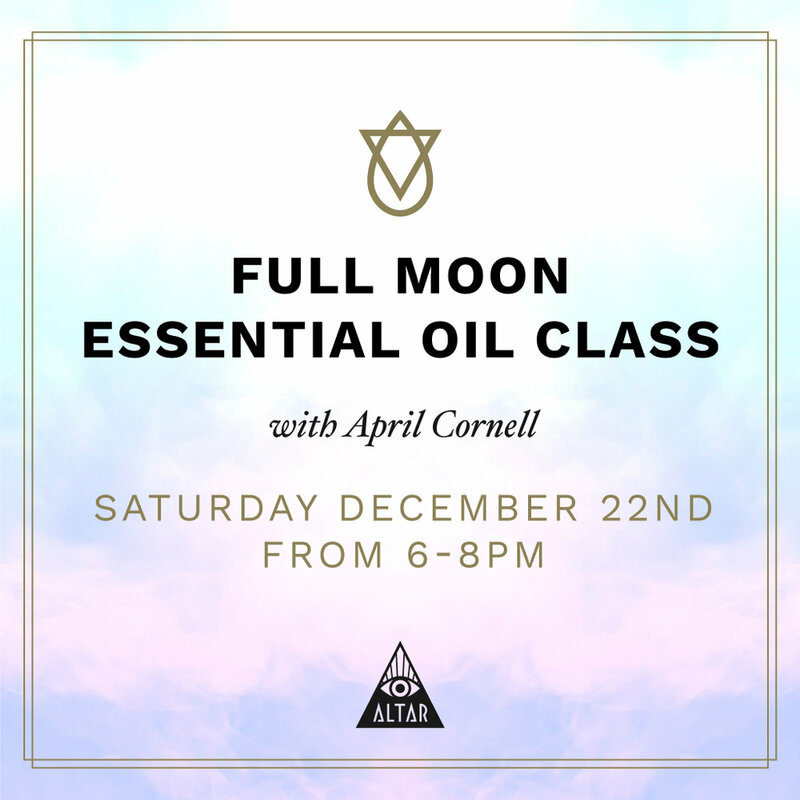 This class has some essential oil knowledge basics and focuses on the full moon energies, including guided meditation journey, ritual work and self exploration. RSVP is required as space is limited and can be given at this link. This class will focus on education around using essential oils for your overall wellness. We will be discussing intention, manifestion and getting you ready for the new year! Everyone will be leaving with an essentail oil blend. RSVP is required as space is limited, and can be done at this link! 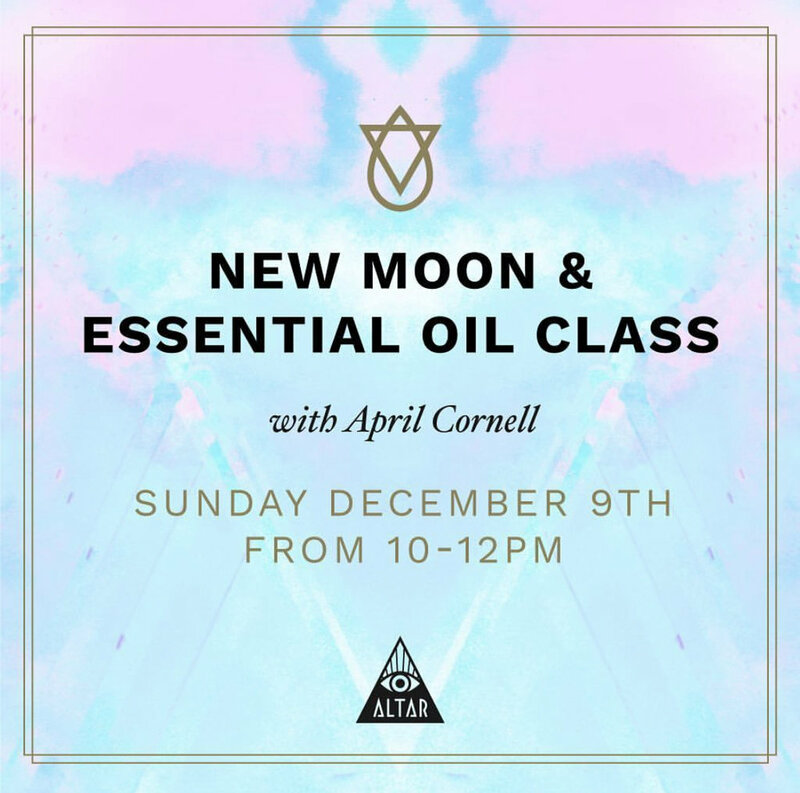 We will be discussing essential oils and the energies around the new moon this December. Everyone will be leaving with a blend to support them through the coming weeks until the full moon. This class is focused on your wellness using essential oils and supporing your energy. RSVP required as space is limited, click here for the link to Eventbrite. The intention of this class is to set a Sacred Space where you can experience self-healing work. We'll create a ceremonial offering to assist you with multi-directional grounding in your body, prepare for Theta brainwave state, then relax into journeywork through the sound bath in order to cultivate a deeper resonance within yourself. Our journey theme is inspired by Beltane. Join me for an exciting night of ritual under the full moon in Gemini! 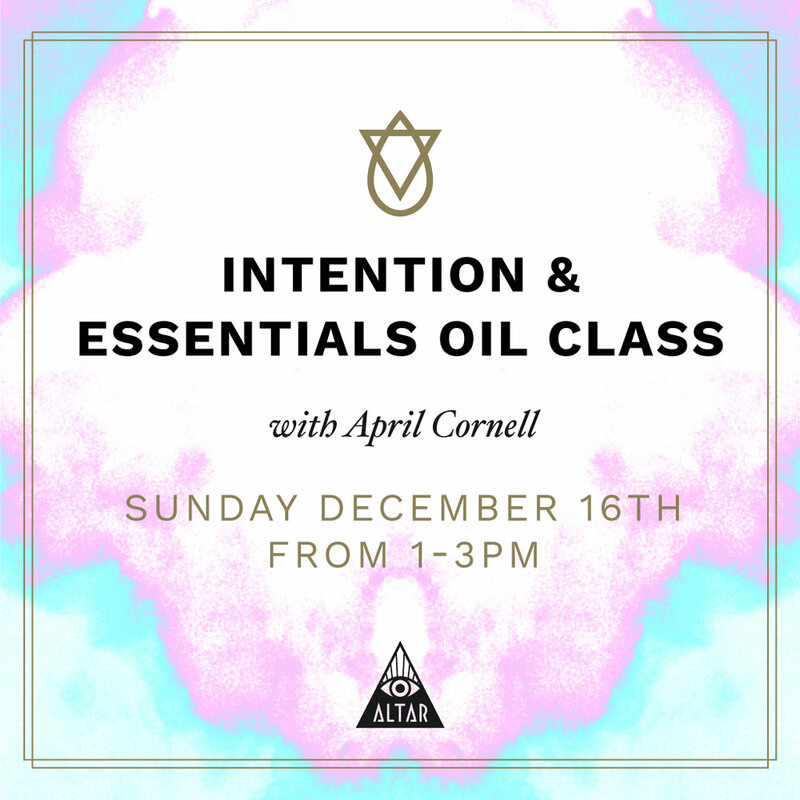 This class includes, essential oil wellness + meditation & grouding journey + intention and release exploration + oil blends to take home + crystals & more! RSVP + tickets are required as space is limited, tickets can be purchased through Eventbrite. Come discover how essential oils can improve your overall emotional wellness! We will be making an uplifting blend to support you through the grey Seattle months ahead. RSVP and tickets required as space is limited, and tickets can be purchased through Eventbrite. 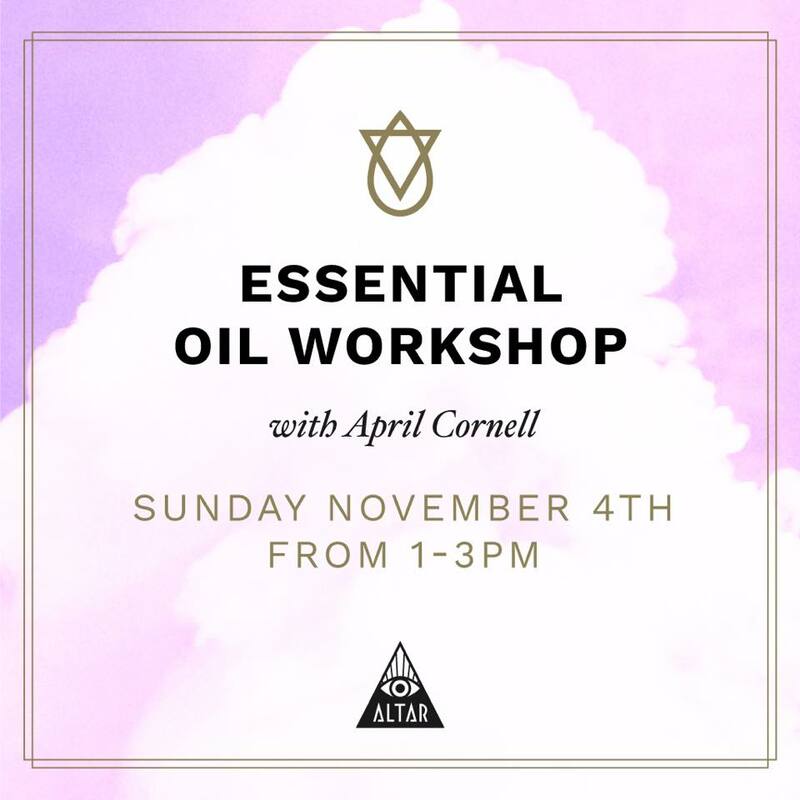 Join me at Altar for an Essential Oil workshop not to be missed! ⭐️ We will be discussing ways to support your overall health with essential oils. 🌚 New moon Intention setting + meditation. ⭐️ Plus a blend to support you for the upcoming months energies! 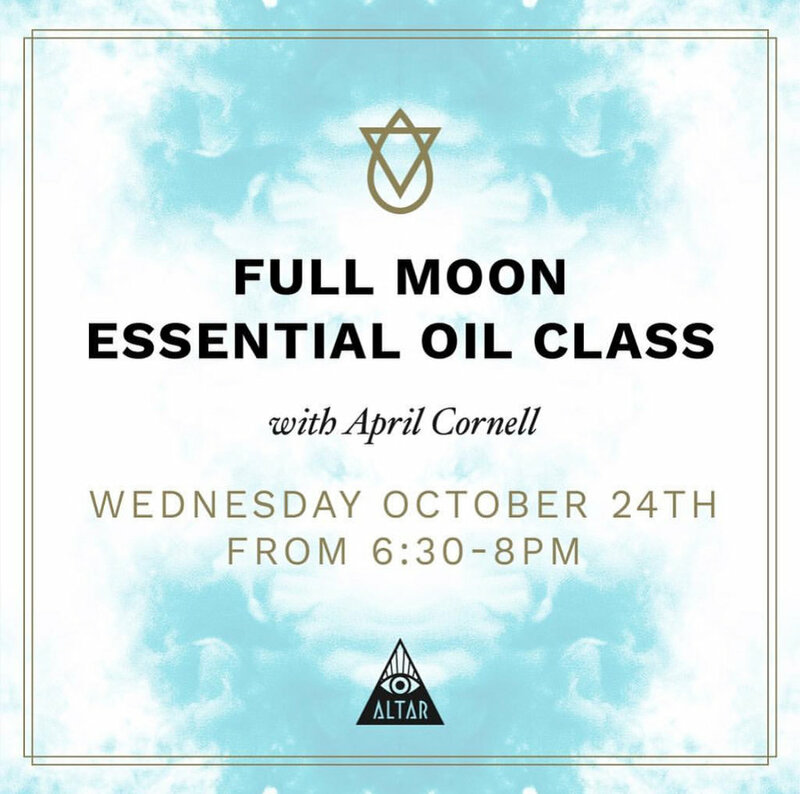 Come explore the MAGIC of essential oils and the full moon energies with me on October 24th! I’ll be teaching a workshop on using essential oils with manifestation, meditation and supporting your emotional and physical health needs. We will be making a blend infused with your intentions to take home with you! Bring an open mind and curious heart! Space is limited, please register ahead of your arrival by following this link to Eventbrite. 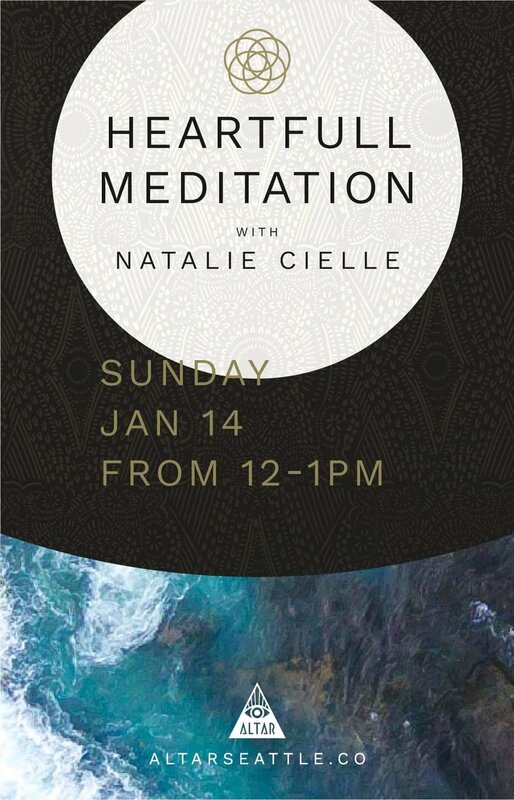 Come learn simple, powerful meditation techniques to help you navigate life with more energy, intuition, and love. Natalie Cielle is a long-time yoga and meditation practitioner who co-founded Seattle nonprofit Yoga Behind Bars. 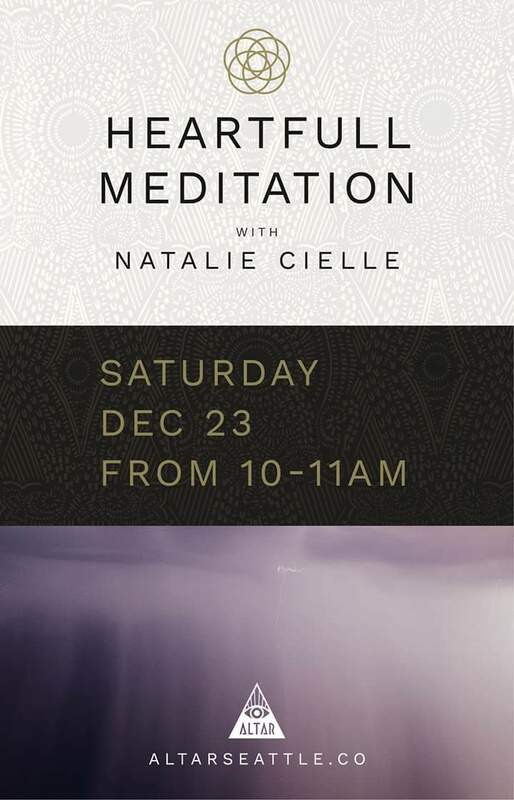 She teaches Heartfull Meditation, a non-religious, guided meditation that is anchored in the heart chakra. 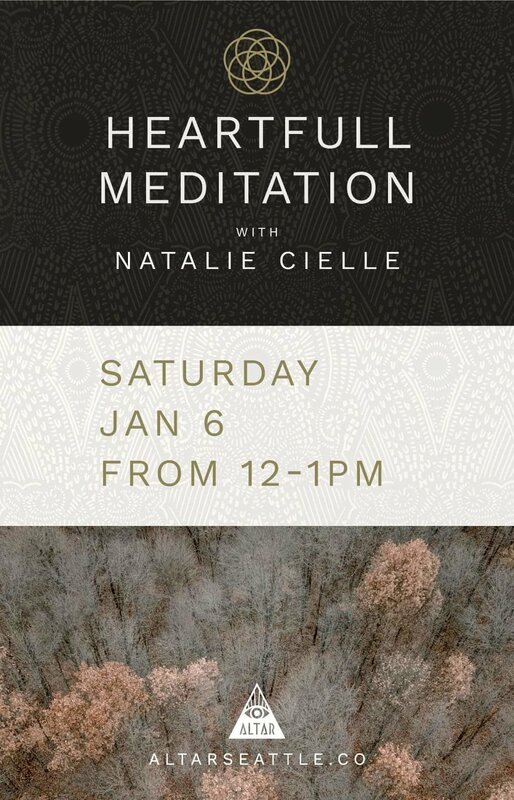 Suitable for all levels, and geared towards first-timers, this introductory class will be held in the beautiful sacred space of Altar. Call or stop by Altar to register! Cost: $20 Space limited to 15.